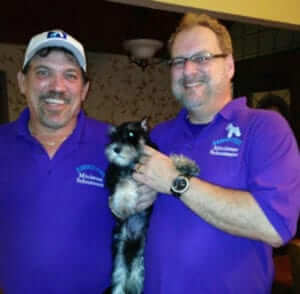 At Reberstein’s Miniature Schnauzers we take GREAT pride in raising the very best miniature schnauzers in the world. Awesome temperaments, healthy, well-bred, beautiful, and intelligent are just some of the few reasons why people choose a Reberstein Miniature Schnauzer above all others. But don’t take our word for it, read our testimonials to see what our satisfied customers are saying about us. We take our customer reviews extremely serious. as they are a direct reflection about our business to the general public. We always encourage our customers to share their experiences about Reberstein’s Miniature Schnauzers. Our reputation means everything to us, and we always strive for excellence. We are committed to the Miniature Schnauzer breed, and every customer who adopts a Reberstein Miniature Schnauzer puppy. Ever had the pleasure of meeting . By accident, after a scam job from another breeder. Most loving precious puppy I have ever had . I never seen such beautiful and intelligent dogs. So happy with my puppy...you don’t just buy a dog you also get Dennis’ expertise’s and advice. Very impressed with this breeder and his lines. I spoke to several breeders before making my final decision to purchase a Reberstein Schnauzer. I had the opportunity to meet with the breeder and all of his dogs . It was very apparent that not only were they well cared for but the love and commitment that they had for them is often not seen....they were treated as family members.